Notre Dame Football has not enjoyed very much of the “Luck of the Irish” over the past five seasons. The Fighting Irish are looking to change that as they change scenery for their Sept. 1 season opener in Dublin, Ireland, against the Naval Academy. The Irish have the experience and firepower to hang with just about anyone, but the annual questions that seem to surround the program are still there, including a big question mark at the quarterback spot and a potentially unstable situation in the secondary. Head Coach Brian Kelly has overseen back-to-back 8-5 campaigns in his two seasons in South Bend, both of which ended in mediocre bowls, the 2010 Sun Bowl and 2011 Champs Sports Bowl. To be fair, those are improvements over Charlie Weis’ last three years (3-9, 7-6, 6-6), but it is not what Notre Dame administration had in mind when they brought Kelly over from Cincinnati. The pressure will ramp up slightly for Kelly in his third season as Notre Dame has the experience and a navigable schedule to be a legitimate BCS bowl contender. Kelly, like Weis before him, was brought to Notre Dame because of his offensive reputation. The high-scoring offense Kelly's teams often showcased in Cincinnati have not made the transition to Notre Dame. The Fighting Irish ranked 49th in NCAA with 29.2 points per game. The offense averaged 253 yards per game through the air and 160 yards per game on the ground, 40th and 55th best in the NCAA, respectively. In perhaps a sign of desperation to get the offense kick-started, Kelly made a curious switch among his assistants moving safeties coach Chuck Martin to offensive coordinator and quarterbacks coach. His job as quarterbacks coach might be his most important as no clear-cut signal-caller has emerged as a starter. There is junior Tommy Rees, who threw for 2,871 yards last season and is 12-4 as a starter. There is junior Andrew Hendrix, who showed plenty of potential last year in different situations. There is also a pair of young blue-chip recruits, Everett Goldson and Gunner Kiel. Whoever is under center, they will have a ton of experience around them with the only significant loss from last season being wide receiver Michael Floyd. And after totaling 1,147 receiving yards last season, the loss of Floyd is significant. Tight end Tyler Eifert is a leading contender for the John Mackey Award and even a preseason candidate to the Maxwell Award as is running back Cierre Wood. Whoever wins the quarterback job will have plenty of protection in front of them with two Outland Award candidates bolstering the line, offensive tackle Zack Martin and center Braxton Cave. The defense is built around the front seven, where senior Manti Te'o headlines an experienced and deep group. Te'o, an all-American as a junior, surprised many by coming back for his senior year. There are even future college football odds on 5Dimes to wager on Te'o winning the Heisman Trophy at +22,500. Sophomore defensive ends Aaron Lynch and Stephon Tuitt both had breakout seasons as freshmen. There will be extra pressure on the Fighting Irish front seven because it is playing in front of a rebuilding secondary that has to replace three starters from a year ago in Robert Balton, Gary Gray and Harrison Smith. That secondary limited opponents to 205 yards passing per game, which helped the overall Notre Dame defense finish 24th in the country in scoring defense (20.7 points per game). There is no schedule quite like Notre Dame's on a yearly basis and this year is no exception, with the Irish opening the season in Dublin, Ireland, against Navy with a 9 a.m. EST kickoff. 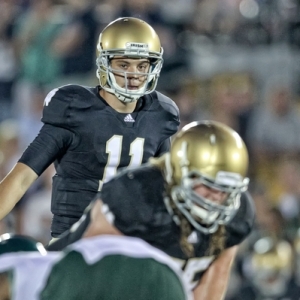 Seven days later the Irish return to South Bend to play Purdue. Two games on two different continents, one week apart, even when the teams are not challenging, is a tough out for any team. After Purdue comes a gauntlet of games that will make the TV networks smile and Notre Dame fans cringe. The Fighting Irish travel to Michigan State before hosting Michigan in back-to-back weeks, both with primetime kickoffs. After a bye week, Notre Dame hosts Miami, Stanford and BYU in consecutive weeks before traveling to Oklahoma. Things get slightly easier down the stretch with games against Pitt, Boston College and Wake Forest, but things culminate with a trip to Southern California on Nov. 24. The Notre Dame schedule features two national title favorites in Oklahoma and USC. Notre Dame is a 30/1 longshot to win the National Championship on Bovada and +1600 just to reach the BCS National Championship Game. On a college football future prop bet, you can wager on Notre Dame making a BCS bowl (+300) or missing out on one (-420). The Fighting Irish college football win total is set at eight on 5Dimes. Future college football point spreads available on 5Dimes include Notre Dame as a 2.5-point favorite against Michigan, a six-point favorite against Stanford, a 10-point favorite against Miami and Boston College and a 13-point favorite against Pitt. The Fighting Irish are underdogs against Michigan State (+2.5), Oklahoma (+12.5) and USC (+13.5). The schedule is one of the things that make Notre Dame who it is, but it also one of the things that make predicting the Irish to make a run at a National Championship very difficult. With Oklahoma and USC on the Notre Dame schedule, a shot at a BCS bowl game, let alone a BCS National Champion, seem very slim. With a season win total posted at eight, the wager seems destined for a push but with Oklahoma and USC both on the schedule, seven wins is much more likely than nine, so the “under” on Notre Dame wins appears to be the smarter wager.